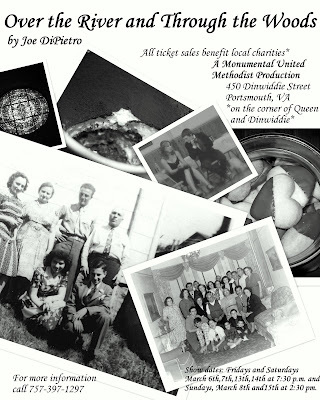 I'm hawking tickets to a community theatre production of "Over the River and Through the Woods" by Joe DiPietro. I'd like you, dear reader, to purchase a ticket or two (or three or four or more). Why? Because ticket sales benefit the Tidewater Critical Incident Stress Management Team, a crisis intervention team that assists police officers, fire fighters, EMTs, and other emergency first responders in southside Hampton Roads and the Eastern Shore. 100% of the ticket sales benefit the CISM Team. The team will use the funds to train volunteers and provide some of the operating funds for the team that services several thousand emergency services providers in Tidewater Virginia. The production is by Monumental United Methodist Church on Dinwiddie Street (at Queen Street) in Olde Towne Portsmouth and is part of their outreach & community support program. They put on a theatrical production; local non-profits each sponsor one production and get to sell tickets to that production. And then the non-profit gets to keep all the ticket sales. Our show, the show that supports the CISM team, is March 8th at 2:30pm. What's the play about? Here's a summary of the play I found online written by Mark S. P. Turvin: "Nick is the last of the younger set not having fled from the controlling influences of his grandparents Frank , Aida , Nunzio, and eternally house coat-clad Emma. When Nick receives a promotion that will send him to the other side of the continent, the four come up with a plan to keep him around by setting him up with the sweet Caitlin O'Hare without telling him during one of their Sunday dinners." My wife, who happens to play Caitlin, tells me the play is really about food. She said it's about family (Italian families, actually) and food. And, in this case, the production is about helping the community. If you're interested in supporting the CISM team and would like to buy a ticket (or two or three or four or more), please contact me here or leave a comment below. I'll get the tickets to you or hold them at the door for you. Please support the CISM team, and community theatre. I hope to see you Sunday for the matinee production of "Over the River and Through the Woods."